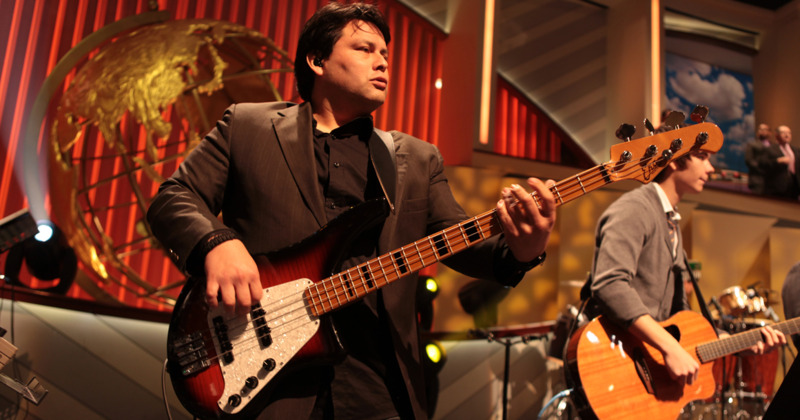 Abel Orta was born and raised in San Antonio Texas, and began playing bass guitar and singing at age 13 and has been performing in both categories since. Abel is a versatile bass player with a unique sound. His influences are that of Abraham Laboriel Sr. Marcus Miller and the late Jackie Street. In 2001 Abel and his family moved to Nashville, Tennessee and was bass player and back up singer for International Recording Artist Jaci Velasquez. Abel also has played and sang on many recording projects and performed on stage with various artists such as CeCe Winans, Michael W. Smith, Lincoln Brewster, Promise Keepers, Ricardo Sanchez, Abraham Laboriel, Justo Almario, Alex Acuña, Lyle Lovett, Bryan Duncan, Tommy Simms and Point of Grace, to name a few. Abel also played and sang the lead vocals on two albums of Latin Americas Alvaro Lopez and Res-Q Band. Abel’s versatile talent has made room for him and has led him to perform all over the United States, Latin America and other parts of the world including South Korea, London, Northern Ireland, South Africa, UK and Canada. Today, Abel resides in Houston, Texas and is currently on staff as bass player, worship leader and song writer at the largest church in America - Lakewood Church where approximately 40,000 people visit each week, is watched by over 7 million people through television and is seen in almost 100 nations in the world. Abel played on Lakewood’s latest 2 albums of which one was debuted on Billboard Magazine’s top 100. As bassist and singer Abel travels with Joel Osteen Ministries world-wide filling arenas to capacity including Yankee Stadium, Madison Square Garden and Dodger Stadium working with Pastors Joel & Victoria Osteen and International Worship Leaders and Grammy Ward Winners Pastor Marcos Witt, Israel Houghton, Da’dra Greathouse, Steve Crawford and Cindy Cruse-Ratcliff.